Welcome! 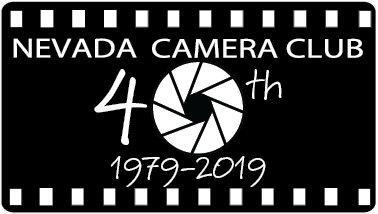 Since the fall of 1979, the Nevada Camera Club has fostered a spirit of learning, sharing, and growing regarding our passion for photography. We are affiliated with the Photographic Society of America. Whether you are a beginner, a seasoned professional, or somewhere in between, there's something for you in the program meetings, competitions, field trips, and special events our Club promotes and conducts. Check the calendar, drop in for a visit, or call one of the officers or chair persons to find out more. We hope to see you soon! Below are the blue ribbon images from the last electronic competition. The Nevada Camera Club has a long history of outstanding programs for the photographer at any level. The topics are a mix of inspirational, technical, and hands on with our cameras. We have professional photographers as speakers who share their expertise in their photographic discipline. The images and information presented inspires our members and guests alike. Our programs are presented at our first meeting of each month. If you’d like to attend one of our programs or become a featured speaker please contact our Programs Chairperson. Hello Adventurers! !The club hosts 1-2 field trips per month, depending on the time of year. All skill levels are welcome, we all learn from each other. The goal is for everyone to have a great time, take a great shot, and learn something new or share a special skill. And of course to hang out with like minded people who can stand in the desert for hours on end waiting for light to change!! Check the current newsletter for details of our next trip. The Alternative Processes group focuses on non-traditional, non-mainstream photographic activities. Examples include, but are not limited to, pinhole photography, cyanotype printing, birefringent microscopy and extended depth of field techniques.